scoilmhuiretullamoreblog | Proudly educating the children of Offaly since 1957. We hope that you are all enjoying the holidays! A few photos of gorgeous Easter art by Ms Delaney’s class of artists! Breaking news!!! Scoil Mhuire has just been awarded it’s 7th Green Flag!! Global citizenship and Energy was the theme of this flag and with our dedicated Green Team at the helm, that much coveted 7th Green flag has been secured!! 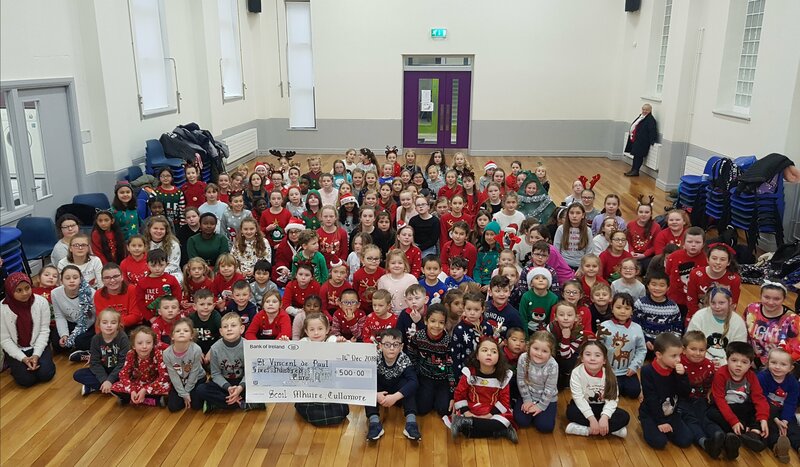 Well done to everyone involved and especially to Ms. Mahon who is the Green Schools co-ordinator at Scoil Mhuire. Thank you so much to everyone for contributing to this year’s Easter Draw. Another magnificent success. Thank you also to the Parents Association for organising it yet again. The hampers get better and better every year! Lucky winners. Wishing everyone a wonderful Easter from all of us here at Scoil Mhuire. Ms. Mahon’s class made the most beautiful Easter Bonnets for art this week. It looks like we have a few milliners in our school- Philip Treacy has some serious competition!! Well done to our wonderful group of students who didn’t miss a single day of school since the beginning of this term in January. Great achievement!! Enjoy the break! Thank you to our lovely neighbours, the boys of Scoil Bhríde for spring cleaning our shared drop and collect area. You did a fabulous job!! Teresa Mannion watch out!! Ms. Reddan’s class played a stormer today in school…here are a few photos of her budding meteorologists and their anemometers! Junior infants got a great surprise when the Easter bunny left them a treat today. Happy Easter from all in Scoil Mhuire!! Scoil Mhuire students making the news yet again!! Well done to the girls of 6th class representing team Phozie and hitting the headlines of the Tullamore Tribune! Looking fabulous!